The art of making soap is a little bit difficult for novices. But once you understand well the process and the safety techniques, you can master the skill. Here I’m going to show you a basic soap recipe, which contains natural ingredients and is safe for your family. I was sifting through post after post trying to find a homemade soap recipe on the Internet without lye, which seems to be caustic, but I failed every time. It appears that lye is a basic ingredient in soap recipes. So hence, my recipe is going to include lye. Here is what I came across with. Prepare a clean mold and spatula in advance. Mix your lye and water and let the solution cool. You need it to be 110 degrees F. Then mix together all oils and heat them gently. Your goal is to reach the same temperature as your lye solution. Blend the two mixtures. You may use a spatula or a whisk. Stir well. Add shea butter and keep stirring. When you are done, it is time to pour your soap into a clean mold. It is a wise idea to cover it with heavy blankets, as they will not allow the heat to escape. Let it sit a couple of days so the mixture can cool completely. After 24 to 48 hours take the soap out of the mold and cut into bars. It is a good idea to let the pieces sit another two weeks so they can cure. Voilà! Your homemade soap is ready to use. •	It’s all in the details. During the process, lye reacts with the base oils, which results in a solid soap. This will determine how much lye you are going to need. Hence, if you run out of oils, don’t ever replace them with other types of oils. Otherwise your experiment will not be successful. Measure carefully all the ingredients and do exactly as the recipe says. •	Oils don’t combine easily with lye and water. To do the trick you need to bring them to similar temperatures. However, be careful not to start a fire. You shouldn’t let the oils get as hot as when they are ready to cook with. So on the one hand, you will have to warm up the oils; on the other hand, you may have to wait for water and lye to cool a little bit before you add them to the oils. •	If you use a whisk to stir the soap mixture, it may take hours until you achieve a homogeneous mixture. That’s why it is better to use a spatula. 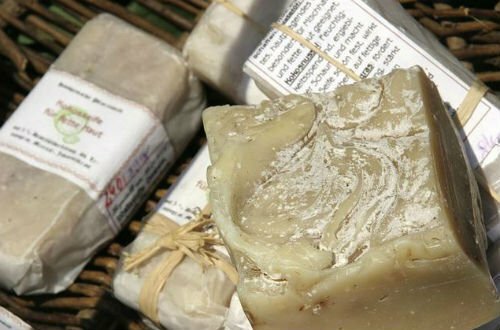 •	When you cut your soap into bars, it is wise to store it in cool place and on brown paper. It is best to use the soap after it has sat one month. •	Wear protective clothing and goggles when working with the lye. And don’t breathe the fumes. •	Virgin olive oil is not suitable for making a soap. Besides it’s expensive. Instead use pomace olive oil. So this is how you can prepare your own homemade soap. Hope it works for you. The essential oils will make your soap antiseptic and antibacterial. There will be no artificial perfumes and fragrances that irritate the skin and lungs. The next time you want to make a DIY soap, try out this recipe. ALWAYS pour lye into the oils. Oil is heavier than the lye solution. It could splash up on you and burn. Always use rubber gloves and safety goggles through the entire process. Do this step outside, or near a window for good ventilation. Don’t want to breathe the fumes. ALWAYS neutralize the bowl, spatula, or anything else that touched the lye solution or soap emulsion with a vinegar solution. Don’t touch un-neutralized solution or soap emulsion with your bare hands. Don’t pour it down a drain when it isn’t neutralized. Neutralize the gloves with the vinegar solution after neutralizing everything else. Alternately (recommended), you can place the items on parchment or a paper bag to dry overnight or up to 24 hours. Scrape the majority of the soap off onto the paper, then use water to wash the items with the remaining soap. It is no longer caustic. Saponification (soap creation) is complete. Curing the soap for four weeks is to allow the water in the soap to evaporate out and make a hard bar of soap. If you use this method, neutralize your gloves with a vinegar solution before rinsing, drying, and storing them. 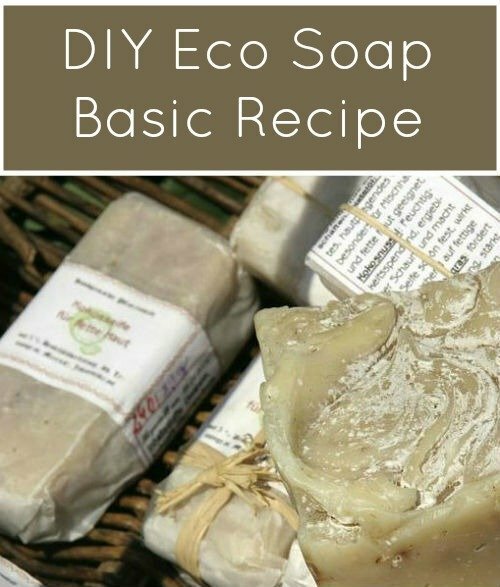 You can throw the soap scraps away with the paper, or make liquid soap. Crumble them up and put them into a pump container. A good ratio is 1/4 soap to 3/4 water. The soap will melt in a few days. Shake then use. No waste, more DIY! Thank you so much, Tam! I would love to include your precautions in the post, if you don’t mind. Do you have a website I can reference?